How does GoAntiquing! process credit cards? GoAntiquing! now offers integration of Credit Card processing. We are partnering with CardConnect, a First Data company. The integration is currently in production status, meaning we are offering this solution to all customers. Currently we have 20 customers live with this as of 02/13/2019. All customers using it have been very pleased with the speed of processing and the efficiency it brings to the checkout process. If you would like to go live with this you will need to first be a paid customer and current with the annual support fee and then work out the details with CardConnect for device and contracts. Question: How do I get started? What is the best way to contact CardConnect? Answer: CardConnect has provided this Signup Form for you to use as a starting point. A call back will be very fast, usually within the hour. On this page is an option to upload your most recent statement from whatever company you are currently using for credit card processing, you can upload this in the form of a photo of the bill or a PDF file. You can also possibly type into the Comments section the totals. Of course you may also call CardConnect directly at 877-948-9733. Question: What exactly does "integration" mean? Answer: It means that instead of having to enter the total that GoAntiquing! calculates manually into your credit card device, the total will appear automatically on the device and prompt the customer what to do, and if they accept or decline the program gets notified and will either proceed with the transaction or stop it. Question: Is integration going to be a requirement? I am happy doing things as I always have! Answer: It is not a requirement for you to use the integration feature. We will never make this a requirement. You will certainly gain a lot of efficiency and accuracy if you do choose to do so, but that is your decision. Question: That's a relief! I am not ready to migrate to your partner's service, or I may never do so, plus I am new to your product. So how do I complete a sale when the customer wants to use a credit card? Answer: Basically, just ring up all the items that the customer has, the software will give you the grand total. Then you will manually enter this into your credit card device or software. Once you get approval of funds you return to GoAntiquing! and complete the sale. You can enter some sort of "authorization response number" or "auth code" at this time. If you do not want to enter such a code there is a setting (go to "Settings / General Settings / Cash Register / Validations") that can be disabled. Question: When I do choose to go forward with integration, how much will this cost me? The device itself, processing fees, etc.? Answer: This is something you will take to the CardConnect sales representative. Prices do change for the hardware and setup, so of course it would be wrong for me to state such things on this FAQ page. As far as fees are concerned, CardConnect does offer two models: flat rate and interchange plus pricing. Flat rate is similar in concept to what is offered by several providers of small card-swipe devices that plug into your phone. Interchange plus is based on actual bank and government fees all lumped together and the rate varies for different types of cards. Question: I am currently in a contract and cannot get out to switch, what are my options? Answer: You will either need to wait until your current contract is up and reassess at that time, or make an executive decision that the integration is so much of a benefit that the cost of getting out of the contract and starting up with a new provider is worth it for the business. Question: I contacted CardConnect and they need some information from me to determine the best option for my business. How do I determine my average credit card transaction amount? Answer: It is important to get a feel for how many transactions you process and the average size of them, as that will help CardConnect find the perfect solution for you. You can get this information by running the "Receipt Log" report with Payment type "ALL CREDIT TYPES" selected for a given period of time. The last page of the report gives a total # transactions and the average price per transactions in a box at the lower left corner. Question: Although I do want to start using CardConnect, the provider I currently use has been collecting customer purchase history, integrates with social media, and makes that available to me online so I can offer loyalty rewards and do email marketing. Help? Answer: That is the best question of all, and tough to give a great answer. As far as rewards programs go, we totally understand that, you could have essentially thousands of dollars of potential rewards to offer to loyal customers based on purchase history. It is not possible to somehow automagically migrate those totals from one service to another, but you could likely get a report from your current provider and depending on just how important it is to migrate to CardConnect (for all the improvements and efficiency you will gain), we could potentially assist, but that is a bridge we have not yet had to cross, so don't have a perfect answer ... yet. Question: How does CardConnect handle debit card vs. credit cards vs. charge (AmEx) cards? Answer: These are all treated as Credit Cards for now with the integration we have done, this is a true limitation of the integration that the CardConnect/Bolt system provides. Certainly these cards are accepted, but CardConnect will treat a debit style Visa or MasterCard as a Credit Card when determining rates, etc. The iPP320 (or other) device does not give an option to the customer to select debit/credit and then enter PIN#. Question: Where do I get the early update for GoAntiquing! that has the capability of integrating credit card processing? Are there any other features and fixes in this update? Answer: You can download and install it from this link GoAntiquing! Early Update. Yes, there are quite a few fixes and feature enhancements with this update, beyond Credit Card Integration. There is a Release Notes document available from the GoAntiquing! program's main menu Help option. Question: I've gone ahead and contacted CardConnect and have signed up and received my Merchant ID, the iPP320 device, and some other info, what next? Step 1: Connect the iPP320 to your router or switch. If you do not have a switch or a router right at your counter you will need to figure out how to get one there. TIP: One possibility would be to get a WiFi "bridge", which is a device that usually has 4 Ethernet ports, and it connects to your WiFi router where ever it is in the shop. Plug the iPP320 into that WiFi Bridge. Once the device says "Bolted" it is ready and you can continue to the next step. Step 2: Configure each PC you use. Go to the program's main menu at top of the GoAntiquing! window and select "Tools / Manage Cash Registers"
Your current PC/register will be selected already. Scroll down to Credit Card header. From “Service Provider” dropdown select “CardConnect/Bolt”. Then fill in your MerchantID, HSN, UserName, click padlock icon to set password. NOTE: CardConnect will have provided you with all this information. Step 3: Repeat this for all PC/registers in the shop. TIP: You probably wondered, but YES, It is possible to use one iPP320 for more than one PC/register! Click a question to expand/collapse the answer. What kind of computer do I need to run GoAntiquing! Point of Sale? GoAntiquing! Point of Sale is a Windows program and has been tested to work extremely well on all versions of Windows beginning with Windows XP and continuing with Windows Vista, Windows 7, Windows 8 (and 8.1), and Windows 10. As far as specific recommendations on computer hardware requirements, any computer running Microsoft Windows that you purchase new today or have purchased new within the last 3 years will be fine. We recommend that you put worries about getting the wrong PC out of your mind when shopping and do so based on price and size for your counter area ... though you may want to consider getting a decent flat panel monitor. If you are thinking about using an old computer you have, that is fine, just make sure it functions correctly and is virus-free. If you are buying a new PC - then do not worry about a thing - it will work just fine. But DO get a subscription to one of the major anti-virus/firewall software providers such as Norton, McAffee, AVG, Trend, Avast, etc. Just a suggestion ... consider a flat panel monitor that is 22" or more just because they can show text larger and is easier to read, minimum monitor resolution is 1024x768. BTW, laptop computers are just fine also. Windows XP - Microsoft has stopped supporting this operating system, though GoAntiquing! works just fine with 512Mb of RAM or more installed. Windows running on 64-bit computers - You will be prompted to download an updated Microsoft database driver. Windows Vista/7/8/8.1/10 - The installer will disable "User Account Control" (UAC) and restart the computer. You may enable UAC after installation is completed. Windows 8/8.1/10 - Internet Explorer when run in "desktop" mode at the same time as GoAntiquing! will cause a conflict that slows the computer down substantially; the recommended solution is to abandon Internet Explorer and use a browser such as Mozilla Firefox, Google Chrome, etc. * Some customers who use Mac+Parallels have issues with Receipt Printers. We do not support the Mac side of this configuration, which means that if your Receipt Printer cannot be made to be "seen" by the Windows side, then you are going to have to get a Mac technician or call Parallels Support for assistance. How much does the software cost? Do you have a multiple copy discount price schedule? The first copy of the sofware to be used at a given location* is at full price, additional copies are discounted. All multiple copy pricing is based on 'same time purchase', meaning you do not get the Copy 2 pricing unless it is at the same time (or within 30 days) of the purchase of Copy 1, and you do not get Copy3+ pricing unless it is at the same time (or within 30 days) of the purchase of Copy 2. Each year, on the anniversary of purchase, a $99 Support and Maintenance fee is due. Please see our Support Policy for details. * NOTE: A location is defined as a street address where the software is used. If you are operating an enterprise with multiple locations or stores, then each store is considered a location. ** NOTE: Once an activation code is issued we will not refund your purchase of licenses for the software or services, so we strongly recommend using the full 45 days of the Evaluation/Free Trial period prior to purchase. Do you have any short-term lease options? I sometimes expand from 1 to 3 registers during the holiday season but cannot justify the expense of full licensing. If you need additional temporary registers, we can offer a monthly price based on 1/12th of the cost of the standard pricing model. For example, if you need two additional registers for 3 months (November, December, January), the cost would be ($499/12)*2=$124.75 for the first register, and ($399/12)*3=$99.75 for the second register. For the next year, should you decide to do the same scenario, you would have a $99 support fee due, then the same pricing for Registers 2 and 3 for a total for year 2 of $323.50. We are committed to your success with our product. We will respond to all support requests, either by phone or by email, or Remote Support typically within an hour, though at times response might be longer (weekends are not as quick response time), for example it can be longer depending on how many customers are ahead of you or who might have a more urgent issue. Our bottom line commitment to response is 3 days, this accomodates weekends and holiday periods. We are retail oriented, just like you are, so we know that not everything can be handled during business hours. Much support is handled via the GotoAssist Customer remote support tool and much is handled off-hours. Since January 2010 we have required that customers have a paid-up annual support and maintenance fee of $99 to be eligible for support (or 'in good standing'), which includes the initial 30-days after purchase of any sort of telephone based technical assistance (POS program, PC, or networking), and after the 30 day period, any sort of POS program support using Remote Support sessions, generic Q&A, password resets, as well as re-activation of software on a replacement PC. Essentially anything that might cause you to call and ask for any sort of assistance qualifies as a support incident and if support is due or overdue will mean the current $99 support fee (as well as any past due invoices sent for support or other fees) must be paid at that time. NOTE: The first year of software Support/Maintenance is included in the initial purchase of the license for the software. We will assist with any question related to use and operation of GoAntiquing! We only support the very latest version of the software. If your software is not updated when you call for support you must first get it updated to the current version. We expect that any computer you use for GoAntiquing! is efficiently prepared and free of viruses, spyware, or other malware. We also expect customers who operate a multi-register shop to ensure the same is true of the network, e.g. it is setup correctly for maximum efficieny and speed. See our detailed Network Checklist for specifics about networking. We will train you, the primary contact person of the shop, in use and operation of any aspect of the program, but will not train subordinate staff, as the assumption is you will train your own staff in accordance with your own policies. We have several ways of providing you with support. Typically Support is handled best by submitting a Support Request with a follow-up phone call or email. Most people want to just call first, but it is actually best to start with a Support Request because it opens a conversation regarding issues or questions and attaches your data for us to analyze. To submit a support Request, click the Reporting bar on the left side, click the icon labeled Support, click Add New, and fill in all blanks. Make sure and give lots of details about the issue or question before you click the Submit button. Support phone number is 800-385-7911. There is an urgent feature in the voice menu system which should only be used if the software does not operate at all. We also use a Remote Support tool, provided by GotoAssist, to interact with your computer visually and with mouse/keyboard, to help coach and mentor you, or to solve issues directly. Occasionally extenuating circumstances come up, which might be various scenarios. This section tries to identify some of these and give you insight into how we would proceed should that case arise. Any new customer (since April 2017) that cannot run a Remote Support session, and the support staff determines that is what is needed to assist, will be charged $39 per support call (which must be paid via credit card immediately). This is in addition to the $99 annual fee. The ability to use Remote Support cuts a support call that might take an hour if we only have telephone for communication to perhaps 10 minutes or less. If the person who was trained by our Support Staff leaves the shop, and ownership needs a new manager or primary person trained, that is an additional fee of $125 per hour in 1 hour increments, it is unfortunate we have had to add this to our policy but it is necessary to protect our Support Staff from repeating the same training to different people at the same shop, over and over again. Occasionally we are asked to participate in some sort of data research to assist in determining if theft or other suspicious activities have occurred at the shop. If this involves more than 15 minutes of time, documentation copying, mailing, legal consulation with your attorney or my attorney, interviews / statements / depositions / affidavits for any manner of law enforcement, there will be a fee based on $125 per hour plus any direct expenses. Refusal to pay the fees that are due will mean you are not in 'good standing', all support is discontinued, and the shop will not be eligible for the premium services such as Data Backup and Dealer Gateway. We only mention this as a remote possibility of how to handle a situation we hope never occurs. IMPORTANT: GoAntiquing! licenses are non-transferrable from one business to another (please see the End User License Agreement presented at installation also see the FAQ titled 'What happens if I sell my business? Who owns the software?'. How do you handle software updates and patches? Incremental program updates are free. Updates to the software are handled automatically by the program. Each day, or more or less frequently, the program will check the website for any updates. Note that you can control this from the "Settings / Internet / Application Update" page. The update notification is shown to you and you have the option to read the Release Notes, update the program, or skip the update. Please be aware that support will only be offered to people who are up to date on the latest version of the software. FUTURE SHOCK: At some time in the future we may invest so much time and development into a new major version of the program that it will be a new major version number, at that point this will not be considered an update but an upgrade. For example right now we are at major version 3. It is possible that when we reach major version 4 that an upgrade fee of $99 per location* (regardless of the number of copies you purchased), will be required. However, since 2002 we have not requested such a fee. We are simply reserving the right to do so. * A location is defined as a street address where the software is used. If you are operating an enterprise with multiple locations or stores, then each store is considered a location. If a location has more than 1 copy of the software running the upgrade fee is $99 per location - not per computer. For example, if you operate an enterprise with 3 stores, then the upgrade fee would be $297. What is the GoAntiquing! Gateway usage policy? Brave New Software (the maker of the GoAntiquing! product line) sells the Gateway service on a membership 'seat' basis. Basically, a shop pays for the membership for a certain number of dealers to have access to the Gateway service via on-line sales reports and/or emailed daily summaries or details (Sales Alerts). The pricing is based on a monthly model of '$1 per dealer per month'. This is a bit open to interpretation, so to be more specific, it is '$1 per seat per month'. Remember, you can use the 'Fees & Settings' module to setup a flat fee called 'Gateway access' that can be charged to your dealers if they are enrolled in the Gateway (via the 'Allow Gateway Login' checkbox on their dealer record). The minimum time period for a membership or renewal is 2 momths, and the minimum dealer count is 10 (if only 5 dealers want the service you have to pay for 10). A seat is considered to be a person who logs in using your shop name and their Dealer ID, or who receives an emailed Sales Alert at least once in a month - that login or email consumes a seat and each time that this dealer logs in or receives an email in that month it is the same seat. So if you buy 25 seats you can have 25 unique dealers use the Gateway per month. To protect us from potential for abuse we do not allow you to recycle the seat from a dealer who may leave the shop mid-month and use that for another dealer. That would mean you are trying to double dip a seat for that month. The next month the seat count starts over, so those dealers who have left the shop and will not use the Gateway again are no longer counted as a consumed seat. To try and help shops with growth, we have always run a monthly audit and allowed up to 10% overage of seats consumed vs. seats purchased with the assumption that we contact you to upgrade your membership fee (once you go over 10% of your limit, or at renewal time). This means that a shop who buys 25 seats can use up to 28 before the audit triggers an emailed invoice or an overage fee at renewal time. Our website renewal page will suggest the same level for renewal as the previous period, though when we audit usage we may send either a refund if you overpaid or an invoice if you underpaid (based on a review of usage). Brave New Software does reserve the right to strictly enforce the exact seat count at some time in the future, and we also reserve the right to increase or change the pricing model as necessary (any such changes would be effective on your Annual Support or renewal date). The enforcement of the exact seat count could mean that some dealers someday may see a message such as 'No more seats available, please contact your shopkeeper.' We hope it does not come to that because this is an excellent service at a very low price, so far we have never enforced the exact seat count! UPDATE: 11/3/2017 Due to a very upsetting situation we also now reserve the right to NOT provide this service at renewal time if certain extenuating circumstances occur, such as refusal by a customer to pay clearly visible usage fees, and circumstances such as discourtesy, insults, or abusiveness by a customer to the sales or support staff. I need to repeat my Daily Close Out for a previous day. You may need to do this for various reasons, perhaps staff forgot to do so, perhaps a problem uploading data to the Dealer Gateway due to server error or internet outage at the shop. In the orange bar, at upper right, is a date entry "For date"
What happens if I sell my business, or if I have to close my shop? Who owns the software? The GoAntiquing! software is owned by Brave New Software, LLC, the company that develops, markets, and supports the GoAntiquing! product line. You have the right to use the software in accordance with the End User License Agreement, you do not have the right to sell it separately or as part of the purchase of the computer on which the software is installed. If you sell your business and the new owner retains the exact original name of the shop, and the same physical location, then we consider this to be a simple business change that will require a Support fee to be paid that costs $99. If there is subscription time left for either the Gateway or Data Backup service that transfers to the new owner. However, for this $99 option to be available to the new business owner, the previous owner must be in 'good standing' (e.g., up to date on Support payments and any other owed fees for services, etc.). The new Support fee must be paid before the new owner uses the software. If you sell your business and the new owner does not retain the exact original shop name, or moves to a new location (even in same city) then this new owner is considered to be a new customer and must purchase the software license at full current pricing levels. If there is subscription time left for either the Gateway or Data Backup service are cancelled and the new customer must purchase services at 'new customer' rates (including any discount offers). Misrepresentation of the terms of the sale of the business or change in ownership, to avoid repurchasing the software at current pricing, will result in revocation of software license regardless of Support fees paid. An example of such misrepresentation might be changing of the shop name or location within 90 days of taking over ownership. The software license belongs to you, it cannot be represented as an asset installed on your computer if you decide to sell your computer. If you do represent that the license goes with the computer, then that is fraud, and you lose your right to the license, and the owner of the computer will be using stolen software. If you sell your computer and GoAntiquing! is still installed on it, and the buyer of the computer begins using it, you have violated the terms of your license. The easy solution is for the owner of the computer to buy a new license to use the software. That means they own a license and you own a license. Someday you could use that license again with the payment of an annual support fee of $99. I am still evaluating the Free Trial. After I purchase what happens to all the information I have entered into the software? Actually, you can keep OR delete the data you have been entering in during the Free Trial / Evaluation period. The benefit of using GoAntiquing! Point-of-Sale is this, the Free Trial is fully functional. After you are confident it is the right program for your shop, just purchase it and you keep right on working with no interruption. Also, if you want to wipe out transactions/sales you may have been putting in as test data, there is an option from the program main menu "Tools" called "Delete Old Data" which allows you to do exactly that - delete old test data and keep your Dealers and other configuration data. Do you have any videos I can watch on-line to get a better feel for what GoAntiquing! Point of Sale can do? Yes we do! The demo we have available is a total of 19 minutes and 40 seconds long and is comprised of 3 clips. Additional videos are listed after the third demo clip. The default user 'ADMIN' has no password, just click Login. OK, I've logged in for the first time. What are my next steps? You need to go to Settings and click the General module. Fill in company information and then go to the Rates tab and enter in Local tax info as well as default commission and consignment rates (these are used when adding a new dealer and are changeable when adding a new dealer). How do I take a sale? First you need to setup at least one Dealer. Click the People group and click Dealers. 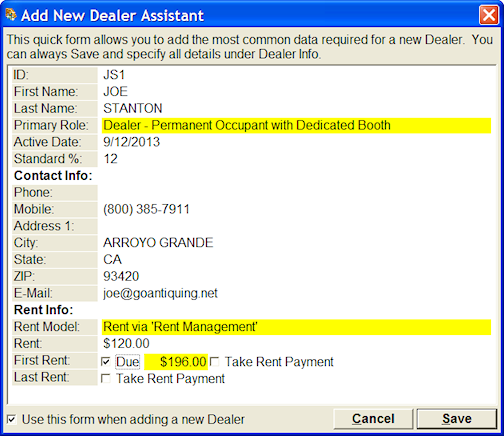 Add a new dealer with the Add button, fill in the dealer ID number, name and phone number, and the commission % for this dealer (typically between 10% and 15%), and use the Rent management to setup their monthly booth rental fee (you can skip rent for testing or if dealers do not pay rent). Finally click Save. Then click the Sales group header and the cash register screen appears. Enter sales information into the grid, when sufficient information is entered the Complete Sale button will be available. Great! The sale worked. Now, how about a layaway? To treat a sale as a layaway simply check the "New Layaway" checkbox on the Cash Register module. Any sale can be a layaway - except a sale that includes a layaway payment. "Below $50 do not allow Layaways"
"Above $50 require 1/3 down with the balance due in 2 equal payments within 45 days"
"Above $150 require 1/4 down with the balance due in 3 equal payments within 60 days"
And so on. You can set the amounts, the fraction, and the repayment term. There is no limit to the number of rules. To take a layaway payment just click the Take Layaway Payment button. A layaway payment is just another item on a sale. The customer can buy other items at the same time, though remember such a sale cannot then be put on layaway! You can track layaways via reporting and can even create letters you can mail to customers with late layaways. There's even more! ... You can charge customers fees for layaway storage! And yet more! ... You can even override the recommended minimum layaway payment and take more or less than then program recommends. Obviously layaways are critical to your business and flexibility in dealing with them is a strong feature of GoAntiquing! Point of Sale. Help! I made mistakes on a sale and need to fix them. How do I do this? The most common mistake made in ringing up a sale is to enter the wrong Dealer ID. Other mistakes can be made of course, such as wrong Item ID, wrong Description, wrong form of payment, or in the worst case, something that affects the actual Total. As an Administrator-level Cashier use the Corrections module under Sales group. Search for the Sale to correct by using the Filter Criteria interface. 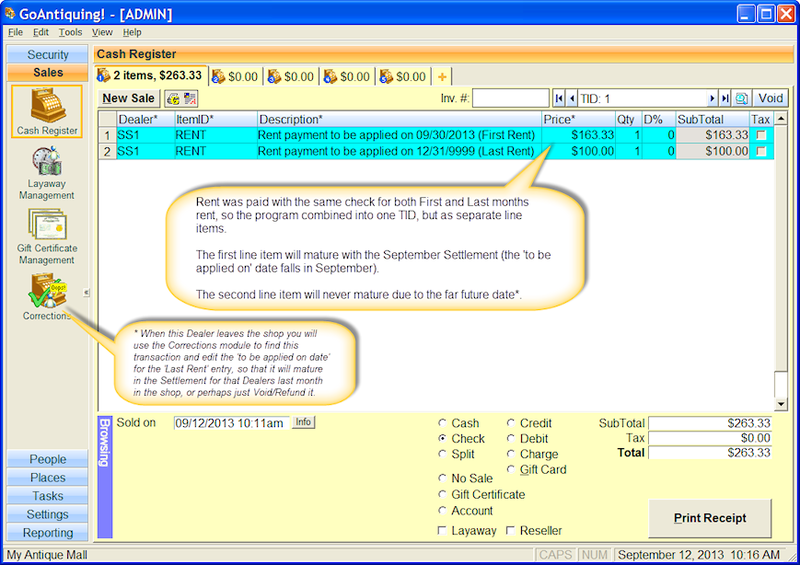 You can change information such as Date and form of Payment at the full-sale level (upper grid), or information such as Dealer ID, Item ID, Description, and Consignment % at the individual item level. To make such changes simply click into the row to change, make the correction, and hit the Tab key to exit the column or click the Save button. You need to do some level of a VOID transaction. NOTE: the term VOID is used to define reversing a transaction OR doing a customer return. Using the TID Navigation/Browser series of buttons near the upper right of the Cash Register page, find the Sale to void. To void the entire transaction simply click the Void button on the TID Naviation/Browser button bar and follow the prompts. To void only some items on a sale first select the rows you want to transfer to a 'Return Sale' transaction and then click the Void button. The items are transferred to a Return sale transaction page from where you must then Complete Return for the void to be completed. TIP: Select a row by clicking on the row header (the gray box at the start of the row with the line number in it). To select more than one row hold down the Ctrl key on the keyboard and click the header. How do I handle rent for my Dealers? I printed some reports but it did not deduct rent! Rent is essentially a periodic fee. To setup the frequency of the rental period go to the Settings group, the General Settings module, and the Settlement tab page. On this page you can specify the rental period. To the right is a picture of the page with the Rent Frequency area inside a blue rectangle. In it you will see 3 selection boxes, ones from which you can click a dropdown arrow and select an item from a list. These 3 lists control how rental periods are defined. In the first box you select the basic measure of time, the options are currently limited to WEEKLY, SEMI-MONTHLY, and MONTHLY. You can then select when the rent is due in that period, the two options are BEFORE FIRST DAY OF and BY LAST DAY OF, which are then combined with the third option of either THIS PERIOD or NEXT PERIOD. What this means is that you can setup rent to be either due for the period that the current date falls within, or for the next period. The common model for most antique malls with rent-paying dealers is to charge monthly rent in advance, which would be 'MONTHLY' 'BEFORE FIRST DAY OF' 'NEXT PERIOD'. Fill in the basic Dealer info, such as ID, Name, etc. For my example below I will refer to Dealer #21. This report is a date-enabled report, so you can set the date range by specific date or by using one of the pre-set dates. By default this report will be set for 'This Month'. In this example I will set the start date to 12/01/2008 and the end date to 12/31/2008. For Dealer #21 rent shown will be the $200 value as that is the 'next month' rent for January 2009. TIP: If you change the rental frequency from monthly to weekly, but leave the amount the same in the examples above, the rent becomes a weekly amount, which would mean that you would have a $100 or $200 weekly rent! So it is important to plan your rent and to be aware how the rental periods and date ranges work. OK, great. BUT ... I have new dealers starting up all the time. How do I handle first and last months rent? First it should be noted that this example shop, like most antique shops, is setup to offset Rent by 1 month, meaning the Rent for October 2013 is due by end of September 2013 (Note: you configure how Sales/Rent/Fee cycles affect such calculations under 'Settings / General Settings / Settlement'). In the Dealers module (located under People main heading) click the Add button and the Add New Dealer Assistant window opens. Fill in basic contact info, ID#, Name, Phone, etc. Select the Rent Model, in this case, and in most cases, use 'Rent via Rent Management' ('Rent Management' can be used later to add/change Rent, it is located next to Dealer Info in the Dealer module). Enter the normal monthly Rent that this Dealer will pay, in this example Joe is paying $120 a month on an ongoing basis. If the first month requires a different Rent amount, or if they have paid you up front for Rent, check the 'Due' box under 'First Rent'. Because Joe entered the shop mid-month, and rent is offset by one month (remember, October Rent is due in the September Settlement), the program calculated the first months payment using the base rent plus the prorated rent for the first month (e.g. $120+19 days @ $4/day = $196). You can also select if Joe actually paid. If you were to do so, then you specify how Joe paid, and the program will add a Rent Payment as a Sale into the system (Yes, in GoAntiquing! you take Rent Payments as if a customer is buying something from you, which essentially the Dealer is doing). In this case Joe will have Rent deducted from sales (if he does not make Rent, then he will need to make a Rent Payment or have the balance carried forward). You also have an option to take a Last Rent payment. If you do so, this is added with a future 'To be applied on' date, this means that when this Dealer exits the shop, you will search for this Rent Payment and make a Correction on the 'To be applied on' on date to be in the final Settlement for that Dealer. So, now just click Save, and the Dealer is added to the list. As you can see below, this flowed to the Dealers Rent Management info. This time we checked the 'Take Rent Payment' checkbox under First Rent, and the interface updated so that we can enter the form of payment and in this case the check number. We also checked the 'Take Rent Payment' for Last Rent and selected Check and same check number. So, now just click Save, and the Dealer is added to the list as before. As you can see, this flowed to the Dealers Rent Management info. And the result of the Rent Payments are shown below, as two separate line items on the same TID (transaction ID). I was setting my Tax Rates and noticed the Default Commission Rates. There is both a 'standard' rate and a 'consignment' rate. I am not sure what to enter in these boxes, can you explain this for me? 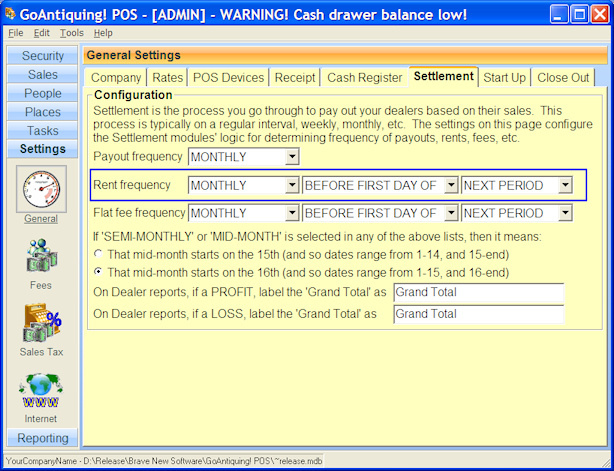 The purpose of this is to set some rates that are used when a new Dealer is added in the Dealer module. You should use just one of these default rates here, and it should be the rate that best describes your shop and how you do business. Typically, if you are an antique mall, you will should set the 'standard' rate to a relatively low level because you would also likely be charging Dealers floorspace rent. If you are a consignment shop you would typically charge a much higher commission rate as you are usually not also charging rent. That said, as you add a new Dealer you can change their individual commission rate as well as rent. Furthermore, at sale time, on an item-by-item basis, you can set a 'consignment' rate for the item which is used instead of the rate that is setup in the Dealer information. This gives you maximum flexibility! I am a dealer and want to supply my inventory list to the shop, so that when items are rung up my descriptions and my prices are used. What is the best way to do this? First, make sure the shopkeeper is willing to accept an inventory sheet. If they do, then from their side, it is important that the data you supply is in a standardized format. 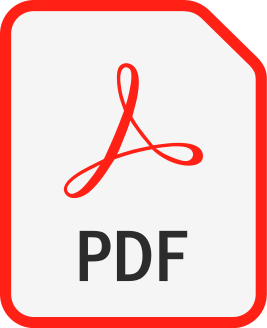 To that end we have supplied a Google Documents Sheet for you to use as a starting point, or template. Please click the link below to access the template. Read the instructions sheet on how to proceed. I want to maintain an inventory, by dealer, for some items. How does GoAntiquing! Point of Sale handle inventory? Using the Item Master module under the Tasks group you can enter in dealer specific items with many parameters. Included are the absolutely necessary Dealer ID, Item ID, Item Description, Price, and Quantity, among many others. The software maintains the Quantity, meaning that as you sell an item it decreases the inventory count, and if the item were to be returned it would increase the inventory count. There is a Reorder report which uses a Reorder Quantity value to determine if the item needs to be reordered. I want to barcode some, but not necessarily all, of the items in my store, and I also sometimes sell retail items that already have a UPC printed on the product. There is a fairly extensive inventory capability in the program. Find the Item Master module under the Tasks group. It is important to understand some basics of barcodes and scanners before getting too deep into how we handle them. There are many different types of barcodes. Most people are familiar with Universal Product Code (UPC) barcodes, that are printed on all retail packaged consumer goods. UPC's are either 6, 10, or 12 digit numbers only. 6-digit codes are called 'compressed UPC'. Another common barcode format is called Code39. This code allows the letters A-Z as well as numbers to be a part of the data stored in the barcode. Using Code39 barcodes we can combine Dealer ID and Item ID to allow dealer-specific scannable items. Any brand of barcode scanner is capable of determining not just the data in the barcode, but the type of barcode as well, and can be programmed to send additional information as 'prefix' data or 'suffix' data along with the actual barcode data itself. This means you can program a scanner to react differently to UPC barcodes vs. Code39 barcodes. TIP: There are some related program options under Settings group / General / POS Devices / BarCode Scanner. We recommend setting Code39 as the default barcode and to combine DealerID and Item ID into the Code39 barcode when printing with a dash separating them. This allows the software to automatically scan the correct Dealer ID and Item ID into the Cash Register Sales screen. TIP: If you are entering in a lot of items you will appreciate the option to 'Automatically add another item for same dealer after Save'. Scenario 1: It is our experience that most of the time when a UPC coded product is sold at a store it is usually the shopkeeper himself making the sale. In this case you would setup your scanner to always send the shopkeepers Dealer ID as part of the UPC code, then a Enter or Return character, then the UPC itself. This may sound strange, but this is a typical task for a barcode scanner. Scenario 2: More than one dealer has UPC barcoded products they sell. If this is your situation you will want to make sure the scanner is setup to not send any Dealer ID specific prefix information. When taking a sale you will have to first select the Dealer ID from the list, then once the cursor is in the Item ID column scan the product. If you have setup the ITEMS.MDB file (see FAQ on ITEMS.MDB) the Description will automatically fill in, and you will then enter the price of the item. TIP: Scanners know what type of barcode they are scanning and can be programmed to react differently to each type. Whatever barcode scanner you buy will need to be configured properly to work with GoAntiquing! Point of Sale (please see the FAQ on Barcode Scanner Setup for more information). I need to print barcodes for my dealers to stick onto their items, walk me through that process please. It's very straightforward, assuming inventory has been setup in the Item Master on a Dealer specific basis. GoAntiquing! can print to either Avery style sheet labels or true label printers. For either type, we support only specific formats or dimensions. The full list is available when in the Reports module. Go to the Reports group and the Reports module will open, or go to Item Master and click the Printer icon on the toolbar on lower right corner of the interface. Note that there are reports for sheet style labels (Avery and a few from other companies) and for regular label printers. There are 8 barcode specific reports that print to sheet-style labels, 5 are Avery (8160/8161/8163/8167/8195), two are from specialty label suppliers for barbell style jewelry labels, and 1 for a custom size rectangle format from Online Labels. There are 12 barcode label formats for true label printers such as Zebra TLP2824. Some of these are labels, some are hang-tags. For the sheet style labels you can customize which labels are missing from the first page of labels you have in the printer. This is the parameter 'Page 1 Labels' . This avoids waste and saves you money. Depending on the report you choose, different parameterized options are available. Generally speaking there are always checkbox parameters for printing elements such as: Descrioption, Print, Date. Some reports have option for printing a markdown schedule. Some reports have a few additional options. These are generally easy to understand based on description of the option. There are various settings for how many labels to print, such as 'INVENTORY' means to print 1 label for each physical item using the Quantity column from the Item Master, or 'INVENTORY+1' which means one extra, or to print 1 and only 1 label per item, 2 per item, or the newly added quantity (just added to inventory) called 'Label Quantity'. 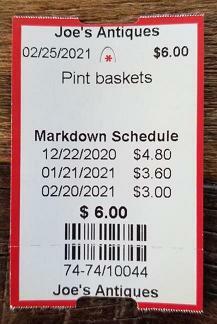 How do I print item tags / labels on a label printer? The Avery style labels are printed onto standard 8 1/2 x 11 inch paper and have no special requirements. If this is the type of label / tag for you, just go to the Reporting module and look at the various 'Barcode Label - Avery' and 'Item Label - Avery' reports. These use the 'Default' windows printer on your system as output. If you need to print on 'hang tag' style stock look at the Reporting module and the 'Barcode Hanging Tags' or 'Item Hanging Tags' reports - there are 1-across and 2-across styles in specific dimensions. These use the 'LabelPrinter' named windows printer (see below). If you need 'peel-off' style roll labels, which are all 1-across in several different dimensions. These use the 'LabelPrinter' named windows printer (see below). If you need 'Jewelry' or 'Butterfly' style peel-off labels you have two options for reports, one that finds the top of the label by a simple measurement, and one that finds the top by a black mark on the reverse of the paper. For the measurement style you will use the report that does not mention 'marks', for black mark style you will select the report with 'marks' mentioned. When using 'marks' the report will look for a printer named 'LabelPrinterWithMarks' (see below). NOTE: We have tested the Zebra LP 2844/2824 and Cognitive Advantage LX, though others will likely work as well. Get the latest version of the software for your label printer by visiting the manufacturers website and downloading it and installing it. Make sure you name the printer 'LabelPrinter', without the quotes, no spaces, and capitalized as shown. GoAntiquing! Point of Sale looks for this specifically named printer for the task of label printing with a true label printer. If using the 'Jewelry' or 'Butterfly' labels with marks for alignment you will need to install a separately named printer driver named 'LabelPrinterWithMarks' and configure it for finding top of label via 'marks'. 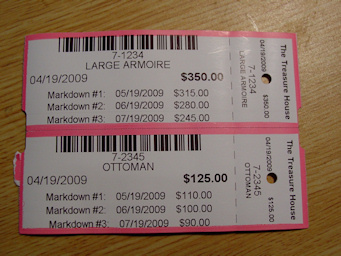 There are several options for selecting which items you will print labels for, including printing labels for all items for all dealers, selecting a specific dealer and printing all items, limiting to 1 per item, exact inventory count, or inventory count+1, and limiting based on items selected (in Item Master you can check a mark on the item to select it for printing). We always recommend that you Preview the report to make sure you are going to get what you expect or you could waste a LOT of labels. You will need to configure the printer properties or preferences. To do so use Window's Control Panel / Printers and right-click the LabelPrinter and select Preferences or Properties (most LabelPrinters put special setting under Preferences). 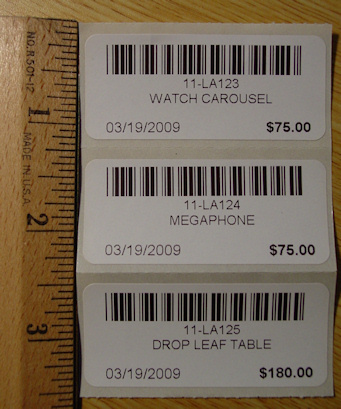 For hanging tag 1-across printing, using the Forms Plus Inc. tags, set Width to 1.56" and Height to 2.37". Set orientation to Portrait, rotate 180 degrees, and if using the Zebra ZDesigner software set all the Unprintable Areas to 0.00". TIP: You may also need to set the checkbox "Always use drivers settings" which is located under the "Printer Settings" page of the printer properties. For hanging tag 2-across printing, using the Forms Plus Inc. tags, set Width to 2.4" and Height to 3.3". Set orientation to Landscape, and if using the Zebra ZDesigner software set all the Unprintable Areas to 0.00". NOTE: This tag generally cannot print on the Zebra TLP/LP2824 printers (as the tags are fractionally too wide), if you want the 2-across type tags you must buy a printer with a wider print area such as the Zebra LP2844! There is one specific report titled 'BarCode Hanging Tags - 2 Across Roll Zebra 2824 Only)' that may work, this depends on your particular printer. For the 1-across style labels set Width to 2.375" and Height to 1.125". Set orientation to Portrait. 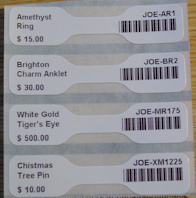 For the Jewelry Butterfly labels there are two built-in options, one for printers that cannot read marks and one that can. Marks are black bars on the reverse side of the label that are used to align the printer. This will cause an item to be priced at full value for the first month, and then discounted by 10% for the next 3 months. This will cause an item to be discounted by $25 after the first week, then $30 the second week, and $50 the third week. This causes the item to be discounted to 80% for 2 months after the first month, 70% for 2 months after that, and finally reduced to 60% after 6 months. This causes the item to be discounted by $50 on May 5th 2009, then reduced to 50% after 6 weeks. 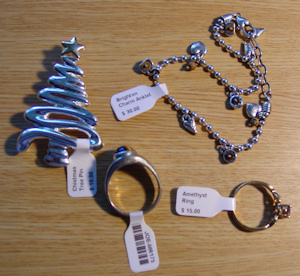 TIP: Forms Plus, Inc., offers the Hanging Tag and Butterfly Jewelry label stock that works with GoAntiquing! Point of Sale. Visit their label ordering page by clicking one of these links: Hanging Tags or Jewelry Labels. Or, you can search for alternate suppliers so long as you follow the dimensions given above any such direct thermal label should work. Forms Plus, Inc., also offers many other labels and forms that would work well for your business. I have a store with more than one cash register (terminal). How does GoAntiquing! Point of Sale work in a networked environment? It's very simple to setup. First, of course, you have to buy a license for each computer that will run the software. Each of these computers will need to have the software installed and activated. Then simply open the database using the menu option File / Open. The typical configuration will be for one of the cash registers to act as a MAIN or 'server' computer and that computer will have the database file in a 'shared' folder. Each computer will refer to that shared folder to find the database file and open it. From then on each cash register will know where to look for the database. The person responsible for setting up the network might decide to place the database on a separate computer that is not used for POS (or perhaps for anything else). This is fine, and is an even better solution as it isolates and protects the database from a possible accidental restart of the host computer that would stop all cash registers from taking sales. In this scenario the server computer would not need to have a copy of GoAntiquing! Point of Sale installed on it as it would just be sharing a folder with a database file in it. Please see our network setup checklist for more information. I have decided to upgrade my network in the shop, buy new computers, as well as the software to run the cash register. Do you have any general recommendations? You bet! Computer networking components have followed the trend of computers and have seen a good decrease in price along with a significant boost in available performance (bandwidth). Here is a diagram of a typical small shop with recommended settings (and click here for a PDF of same). I recommend upgrading to a 'gigabit ethernet' network. Most new computers today will come with an integrated network controller (NIC). You should specify a 'GigE' (gigabit ethernet) controller when you buy a new computer. Your cabling will need to be at least CAT5e or CAT6 cable. I recommend CAT6 as it is more heavily shielded, though a bit more expensive. Along with the cabling you will need a network gateway / router that is also 'GigE' ready. There are many of these on the market. I personally use Linksys products as I find them to be a very good performing product for the price in a small network environment. You should have your shop wired by a professional networking installation company as there are environmental factors that should be taken into account when running cable, such as electrical wires and flourescent light ballasts that can cause interference with the network signal. Do not skimp on your network upgrade! To save money and time, and for convenience, I want to use a wireless router for my network. Is this OK? If all you have is one computer running GoAntiquing!, how you connect your computer to the router and internet does not matter, be it hard-wired or wireless/WiFi, both are OK. However, if you step up from one PC to two or more PC's running GoAntiquing!, then WiFi becomes unacceptable and you would need to upgrade to full hard-wired ethernet using CAT6 cables. So it is important to plan such an upgrade. Why is WiFi unacceptable for a network of Point of Sale computers? Everything else is fine with WiFi, why not GoAntiquing!? Well, WiFi networks are great for email, general internet use like website surfing, streaming audio and video, but are actaully not reliable for transactional connections such as required by Point of Sale programs such as GoAntiquing!. WiFi connections typically drop and reconnect to the router several times a day or more. And so we not only do not recommend WiFi networks for connecting your PC's to each other, we would not sell you the software for a second or third computer running GoAntiquing! if your connection between each PC and the router is through WiFi. Here's the thing, the data sent over the network is critical to your business. Even if secured, a WiFi network is vulnerable to poor signal and loss of connection. This can occur if something as simple as a filing cabinet is moved into the path of the signal or just problems with the WiFi itself. What happens when poor signal quality or loss of connection occurs? Usually "Data Corruption" occurs, which is when the information being processed becomes out of order or scrambled, and causes the database to become non-functional, and GoAntiquing! stops working until it is repaired. What about my tablet or Square I use for credit card approval, they are WiFi and I need them for my business! Also customers and dealers (vendors) sometimes need to use my WiFi while in my shop and I allow that. Does this mean that goes away too? No, not at all. The router can still provide a WiFi signal in your shop, but the PC's themselves will have WiFi disabled so they cannot transmit or receive wirlessly, all other devices you may want to connect through your WiFi will still be just fine, including your customers and dealers phones, your tablet, maybe even your security system. It is just the PC's themselves that must be hardwired. I am a very knowledgeable computer user and am aware of technology such as Terminal Services, Remote Desktop, and Virtual Machines. To centralize my support of the network and improve speed and protect data I want to have all the cash registers connect to a server that they operate remotely. Are there any problems with this idea? Great question! All of these options are possible, though with varying degrees of success with connecting POS Hardware. Receipt Printers configured as 'PRN:' devices work fine. Cash Drawers configured as daisy-chain from Receipt Printer work fine. USB cash drawer will not work. Pole Displays will not work. Label Printers will work fine. When I was in Settings I noticed there is a POS devices tab. Tell me more. I purchased a Star TSP100 and compatible cash drawer based on recommendations from GoAntiquing! support. I need help getting them to work correctly in GoAntiquing! Point of Sale and there seems to be an issue with USB connections? 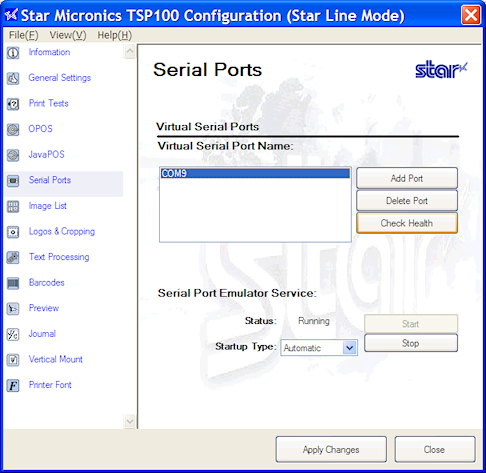 Setting up a USB cabled Star TSP100 does have a special procedure, but it is very simple. Follow these steps to setup your Star TSP100 receipt printer for use with GoAntiquing! Point of Sale. If you are using a Cash Drawer also connected to the system via a telephone like cable between the Cash Drawer and the Receipt Printer the setup for that is included below as well. Open TSP100 program subfolder (if present). Click "Configuration Utility" to run. NOTE: If you are prompted to select one of two or more "Star TSP100" printers, you need to determine which one is active or "Ready" by checking in the Printers list in your computers Control Panel. If this occurs then select the correcet one and click OK. It will prompt you for "Star Line Mode" or "ESC/POS". Choose "Star Line Mode". From the main program menu that appears choose "Serial Ports". Click "Add Port" and enter "COM9" in the field, click OK.
Click the "Start" button in the program to start the service running. Select "Automatic" from the "Startup Type" dropdown. Click the "Check Health" button (to the right of the "COM9" list), it should be successful. In GoAntiquing! Point of Sale select Settings / POS Hardware. On "Receipt Printer" tab select TSP100 and then select COM9. Click the "Cash Drawer" tab. Select "Use" checkbox and select "Receipt Printer" from the list. To test the Cash Drawer you can check the box marked "Pop open cash drawer at any time with hotkey CTRL-F12" and then press CTRL-F12. I have a receipt printer, but it is neither an Epson TM-Series or a Star TSP-series. Can I use my receipt printer with GoAntiquing! Point of Sale? Very likely, though it will be considered a generic receipt printer without advanced features. GoAntiquing! Point of Sale supports two "Generic Text" formats, one at 40 CPL and one at 42 CPL (CPL=characters per line). These printers can be configured as one of the COM or LPT hardware ports, which port will be dictated by the connector type on your printer and what ports your computer has available. You must verify that your printer can actually print from a COM or LPT port! As a COM port device your printer must be configured as "9600,N,8,1" settings, which means 9600 baud, no parity, 8 data bits, and 1 stop bit. 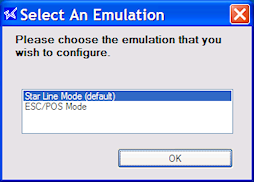 If your printer requires a different set of parameters, please call and we can discuss it, but most printers can be configured to use these standard port settings. Consult your printer manual first. As an LPT port device it should just work, though you may need to adjust BIOS settings for the LPT port. Consult your computer manual. You can test your printer by sending raw text directly to it using the MS-DOS command shell and use "echo test text>com1", etc. TIP: the MS-DOS command "mode" may be useful as well. NOTE: Just because you have a cable that has the correct ends, does not necessarily mean it will work. Some printers require special internal wiring. Consult your printer manual. NOTE: some printers may require a "gender changer" or "null modem" adapter. Consult your printer manual. Your "Generic Text" printer will print in only the basic font that it supports, no bold text, no double size text, etc. Typically if you install manufacturer supplied software drivers that include a Windows Printer object, this will wind up "reserving" the COM or LPT port and should be deleted. NOTE: Some manufacturers that supply USB cabled printers also include a software utility to create a "virtual COM port" or "virtual serial port", etc. In this case DO install their software and follow instructions in their manual to setup a COM port. If you do not have success with your current receipt printer you might be best served to buy an Epson TM-Series or Star Micronics TSP100/600/700 series printer. Or, you can ship us your printer and we can spend a short period of time assessing the device and seeing if it can be made to work. No guarantees are made that we can make it work. You pay shipping and insurance both directions. Please ship such printers to the mailing address on our contact page. How do I setup my barcode scanner for proper operation with GoAntiquing! Point of Sale? Keyboard Honeywell/Metrologic Various models. USB scanners 1690 Focus (USB Imaging scanner), 3780 Fusion (USB Omni-directional laser scanner), 9590 GS Explorer (USB laser scanner), and others. Serial/COM Honeywell/Metrologic Various models. USB scanners 1690 Focus (USB Imaging scanner), 3780 Fusion (USB Omni-directional laser scanner), 9590 GS Explorer (USB laser scanner), and others. This is the software driver that will allow your Honeywell/Metrologic USB barcode scanner to operate via the Serial/COM port interface. Installation of this is not simple. We recommend you contact Support at 800-385-7911 to assist with installation. Keyboard Honeywell/Metrologic Model 5145 Eclipse. A true keyboard "wedge" scanner (means it plugs directly into old-style round keyboard port). Keyboard Opticon Model 6125. A USB scanner that uses LED instead of Laser for scanning. Keyboard Symbol Model LS4000. A USB scanner. If you have one of the scanners described above, great, click the provided PDF link, print the PDF file, and scan the codes in sequence to get setup. Find and scan the special "Reset to default" code. Determine if you will be using the "Keyboard" method or direct USB method of communication, then find and scan the appropriate code. Find and scan the special code sequence to send the vertical bar symbol aka "pipe" (ASCII value 124 or hex 7c) as a prefix to all barcodes. Then send the barcode data. Then send the Enter or Return code aka Carriage Return (ASCII value 13 or hex 0c). Finally tell scanner you are done programming (usually there is a specific barcode to scan in the manual for both Start and Stop). Before scanning press the "pipe" or vertical bar key on keyboard (shifted \ located above Enter key on most keyboards), then scan. Make sure the cursor is inside the Item ID column in the sales grid, and then scan. I need help working with Settlement processing! Can you give me some pointers? Sure I can! First there are some concepts to go over, and then there are sections below that address Rent, Fees, and some scenarios. WARNING: This is a fairly detailed narrative document. I go over some basics of Rent and Fees as well as details of Settlement. Periodically you will be paying out your dealers based on their sales minus commissions/rents/fees. In the classic mode of operation of GoAntiquing! Point of Sale you do this via the Dealer Detail Report and the program adds in pre-calculated Rent and Fees, and if the Dealer sold enough goods to offset the Rent and Fee total then they will show a profit and get a check. If this applies to you and your shop, and you have no interest in learning or finding out about a more complete way to manage Rent and Fees, then stop reading now! Settlement allows you more control over the process by allowing you to adjust any of the categories of positives (sales and rent payments) and negatives (rent due, fees, and debits) that make up a payout. Be sure and have all your Booth’s and/or Dealer’s and Rent’s configured when you create the Settlement because that is when all Rent due and Flat Fees are calculated. Sales cycles and Rent/Fee cycles are typically in different periods. This means that typically sales for the current month are a lump sum from which any Rent and Fees due are deducted, and typically Rent and Fees are for the NEXT period. Rent Payments, if you use this feature, it is important to remember they are transactional (meaning they come from the cash register records) and when they flow to the Settlement, if they are deleted, can reappear when you Refresh Sales. In the fine-tuning section below this is mentioned again. Any Dealers with negative balances after Finalization will find that amount carried forward to the next month as a Debit. TIP: You can create the Settlement at the START of a month, after you close out the previous month via Finalization, this allows you to begin making fine-tuning adjustments as they occur (such as Booth hopping). There are a variety of Settings that affect how Settlements are calculated. Visit the Settings / General Settings / Settlement page and setup how your shop operates as far as Payout, Rent, and Fee frequency. You should only have to set these up once. TIP: I recommend that if you use Rent Payments for past due or future rent, then you set have the checkbox "prompt for rent due date" checked (in Settings/Cash Register). There are two regular ways that you can charge a Dealer (vendors, consignors, etc., I call them all Dealers) rent. Dealer Rent Management. This is the second tab that appears next to the Dealer Info tab when editing a Dealer record. 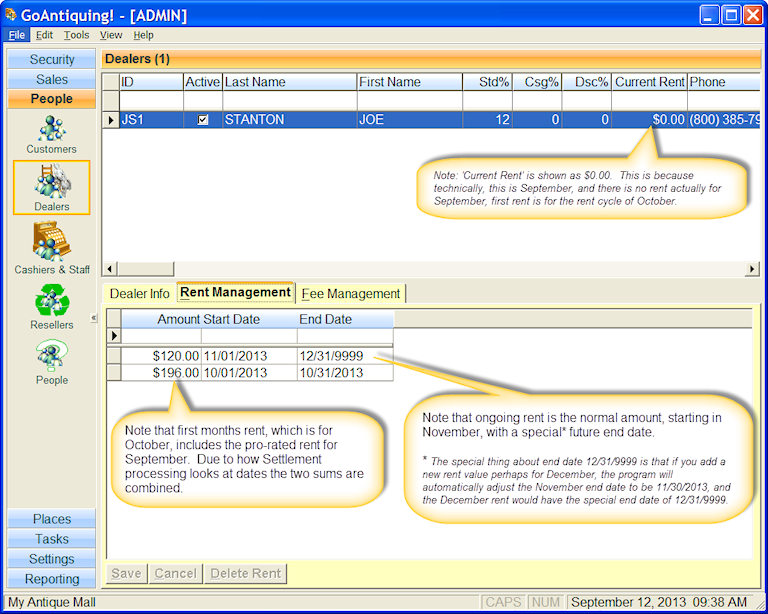 In it you specify a rental amount for a given date range. This tab is hidden if the checkbox "Use Booth Rent" is checked. Booth Rent. This is the rent amount that you assigned to a Booth when you were creating the Booth record (under Places). Note that is not a requirement to use Booths at all. If you do use Booths you can either use them as a space management tool or as a rent management tool (or both). You assign a rent to the Booth, and then you assign a Dealer to the Booth. You can assign the same Dealer to multiple Booths. 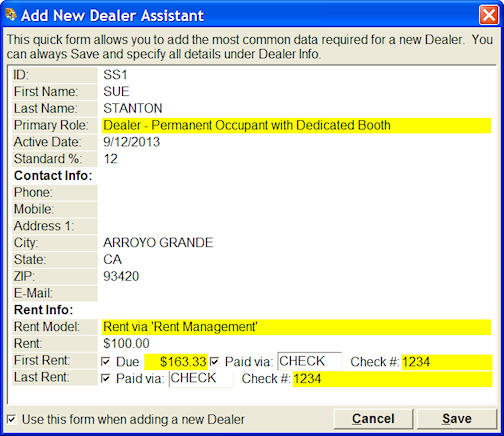 You will notice that back on the Dealer record there is a "Use Booth Rent" checkbox, this must be checked to get the program to add up all the Booth Rent for the Booths that this Dealer has been assigned. You might ask, "What is the best way to handle Rent?". That will depend on your shop. There is more work involved in setting up Booths and assigning Dealers to them. The advantage could be that you can get a "Booth Rent Report" that tells you how much rent you have potentially coming in vs. what you will have coming in. Booths left unrented are potential not being realized. There is also some work involved in managing Dealer rent using Rent Management, setting the amount and a date range for a large shop could be tedious if you have a constantly changing Rent amount, or if people come in mid-month, etc. There is also another way to charge Rent. And that is to manually add a Rent record to a Settlement, see below "Fine Tuning the Settlement". There are several categories of Fees. Transactional Fees. These are the ones based on Credit/Debit card use and are based on a Dealer’s share of a sale. Set these up in the Settings / Fees module. Flat Fees. A Flat Fee, "flat" meaning it is a specified amount rather than a percentage, is charged to the Dealer and multiplied by their specified "Flat Fee Rate" (usually 1). Be careful about "Flat Fee Rate"! If you set it to zero, then those Dealers will not get charged Flat Fees at all because zero times anything equals zero. The point of having this Flat Fee Rate is to allow you to double someone’s Fees if they have 2 Booths, or triple it if they have 3 Booths, etc. Most Dealers will have this set to 1 and that is the value that is set when you Add a new Dealer. Item Fees. It is possible to add a Fee to a Dealer at the cash register by entering their Dealer ID#, then start the Description with the special word "FEE:", that is F-E-E-colon. You then describe the Fee and enter an amount and it is charged to the Dealer when you Complete Sale. This was mainly designed for the shops selling on-line so they can pass on listing fees and so forth, but it can be used for lots of things, such as a way to record a "first month" rent due amount. You’re still reading? Good… Compared to the classic Dealer Detail Report, the more complete Settlement process, which is relatively new and has been in place since the beginning of this year, allows you to collect all the information that goes into the classic Dealer Detail Report, and then adjust it by adding or removing dollars from categories of data that make up the Settlement. You can add and remove dollars from the categories of Rent, Fees, Credits, and Debits. Here is an example or scenario of how a typical settlement process will go, using the classic antique mall / consignment shop model, which is that Rent is due for the next month before the end of the current month. We will also add in the twist of Rent payments taken at the register (another relatively new feature) as well as a 2-day Rent payment grace period. At the end of the month, let’s say June 2009 (hmm, where did I get that date?) , we need to Settle up with our Dealers and pay them or get a check from them. So to get things going, let’s say today is June 30th and we need to see where we stand. A window pops open and has some info on it about the Settlement you are adding. You will notice that the dates are all correct, for example "Pay date" is June 30th and the Pay range is June 1 – June 30. Also notice that Rent is due on June 30th and is for the range July 1 – July 31. The same for Fees. "ALL" Dealers are specified, so click OK. This then causes a progress bar to move across the screen and collects all the data that comprises the Settlement, which is a snapshot in time of how things stand. You are back at the Manage tab, but can click on all the other tabs, Dealers, Sales, Rent, Fees, Credits, Debits, and Finalization. So, included in this new Settlement are all Dealers who are active, all the Rent they are calculated as owing, all Rent Payments (we’ll go over that in more detail), and their Fees. As an example, let’s say you have about 30 Dealers, most of whom have made rent (or have paid their rent) and show a profit, a few broke even, and three owe you some money to get even, and one of those owed you $10 from last month also. The ones who made rent and show a profit have their Payment Amount highlighted in green. Those who broke even have just a white blank cell under Payment Amount and those who failed to get above the zero mark are highlighted in red. NOTE: For the one Dealer who owed you from last month there is also a -$10 showing in the Debit column. This is your basic Settlement. But you are going to wait a few days before you finalize because you have a grace period when the people who owe you money can come in and get even. So, let’s back up to earlier in June. During the course of the month of June, a lot of Dealers came in and wanted to pay their July rent. Using the cash register you can accept a Rent payment by entering their Dealer ID#, and the word RENT in the Item ID column, and then as you exit that field a window pops up asking you on what date the rent should be applied. Just go ahead and click the Today button if the rent is for July and you are actually still in the month of June, or click on any day in June. By doing this you ensure that the rent payment offered in June will be used to balance the rent they owe in June (which again, is actually for the July rent cycle, yes, this is confusing, but is an important concept). NOTE: Yes, this means you could take rent ahead of time, say to take August rent in June, you would select a date "to be applied on" as in July. NOTE: Anyone taking a Rent Payment needs to keep aware of the sales cycle and rent cycle dates and where your shop is in the cycle. Let’s skip ahead now to July 1st. During this day two of the three people who did not make their rent amount in sales come in to pay you the amount they owe. You take the Rent payment at the cash register and when it prompts you for the date "to be applied on" and you enter June 30. This will ensure that the rent they offer is credited against the June sales/settlement cycle (which again is also the July rent due cycle). Great! Well, the evening of July 2nd has come and it’s time to finalize the Settlement. Go into Settlement and select our June entry, click on the Sales tab, and click Refresh Sales. This refreshes Rent payments that came in on July 1st and credits them to the Dealer as well as fixing any corrections you may have made to the POS data (such as changing Dealer ID#’s on sales, or changing commission/consignment rates, etc). You decide to review the Settlement and notice some mistakes made in Rent amounts or a missing Fee, etc. See the next section "Fine Tuning the Settlement". Assuming you have fine-tuned it we continue… Click the Finalization tab and click the Finalize button. Be sure and have enough paper on hand to print everything needed. Whew! All done. The steps I have outlined above are actually pretty simple to work with and once you get into the swing of things it gets easier. Granted, it’s easy to find ways to complicate the process. One of the common complications is Booth hopping. This occurs when a Dealer wants to move from one Booth to another mid-month and you have to figure the rent. Another way is to make a mistake on Rent payments – you should check these over carefully. If you catch these sort of things then you can make line-item adjustments, this is gone over in a bit more detail below. Wait a minute. July 3rd has come and that one dealer who owes you money has come in to pay you. But it’s too late because you have closed the books for June and cut checks and started handing them out. But this dealer INSISTS on paying the rent. Well, go ahead and take the payment. But since June is closed do not set the date "to be applied" on as in June! Set it for the current date. Because what will happen at the end of July when you create the Settlement for that month, is that the previous Settlement is examined and any Dealer with a negative balance shown will have that amount transferred to the new Settlement as a "Previous balance carried forward" Debit! So the Rent payment is accepted and will be shown on the Rent tab as a positive value, and right along with it will be a negative amount for August rent (yes, next rent cycle!). But keep in mind that this "extremely" late rent payment for July is balanced against the Debit. It’s important in the Settlement system to realize that a positive number of any sort, be it a Rent payment or sold items from a Booth, is used to offset any negatives, be it calculated Rent or carried forward Debits, etc. As you are reviewing your Settlement you find some things that need adjustment. There was a Dealer who Booth hopped. She was in a $200 a month Booth for a week, and then you let her hop to a $400 a month booth closer to the front of the store or maybe to a window booth. How to handle this? The issue is that you changed the Booth she was assigned to and because the Settlement was run after that change, it shows $400 owed, but you want to prorate that. The rent should be a total of $350. I highly recommend NOT changing the "calculated" rent amount for the sake of speed, but to add a new adjustment line to the Rent tab for this Dealer and perhaps add a description such as "1 week in Booth 12" and make the Amount negative $50. This will cause the total Rent due for the month to be $350 and documented to avoid confusion on the Dealer Report for both the Dealer and for you when reviewing the record at a later time. Perhaps you had to clean some Dealers Booth because they tracked in some dirt, or maybe there is a piece of furniture that they asked you to polish, etc. I suggest in these cases to add a special Flat Fee using the Fee tab in the Settlement. You will notice that you can both add a positive value or a negative value as a line item under Rent. BUT, if you were to change the amount of a transactional (e.g. from cash register) Rent Payment in the detail section of the Rent, then that CAN BE LOST when you Refresh Sales. This is because Rent Payments are transactional and come from the cash register records. Always adjust individual Rent Payments either by adding line items or, preferably, by voiding/re-ringing the transaction. Also, do not delete a Rent Payment (or a transactional Fee) if you plan to Refresh Sales again, as they will come back after Refresh. Seriously, this is the most common cause of getting rent and fees in a mess and yourself confused. It’s a very important concept. The other scenario is similar to the first, but instead of fixing a Booth hopper, you are evicting. In this case you might actually consider a solitary Settlement for this one Dealer. Or perhaps you will just prorate the rent down. This is a more sensitive and very shop specific issue and I hope you do not have to do too much evicting, but be sure and set the Dealer’s "active" flag OFF after you finalize so they do not keep getting added to the Settlements in the future. NOTE: when you manually add any line item any section of the Settlement it does not go away unless you delete it yourself. So you can Refresh sales all day long and those manually entered line items will stay until you get rid of them yourself. Well, I hope this News Letter / document, detailed as it is, helped to shed some light on how to work with Settlements. I know that this seems like a bit of a difficult task. I admit that the accounting side of this program is more complex than the sales side. I encourage you to review the important concepts, train the cashiers to understand how sales/settlement cycles fit in with Rent cycles. And call our toll-free number 800-385-7911 for support or for more explanation of this subject. I want to print checks directly out of your software. Can I do this? Yes. You can now print checks to 8.5 x 11 paper* check stock! Check out the 'Dealer Checks' report in the Reporting module and the 'Check Designer' tool. Use the Check Designer tool (located under Tools | Check Designer) to specify where on your paper the 'elements' such as Date, Dealer Name, Amount, English Amount, Memo, and even Signature (yes, you can use a scanned signature!) are located. Simply drag the 'elements' around the provided check design area and save it. As you use this feature you will find it to be a good idea to photocopy some of your check stock and run some tests to make sure the locations of the elements match up with your particular checks. * You get the paper from either your bank, an office supply store, or an on-line source. We decided not to try and produce the entire check image due to some issues to do with security features that banks look for in the routing number and account number area. Believe it or not, when you buy a stack of blank checks from either your bank, Office Depot, Staples, or an on-line service, they print the routing and account numbers with a special magnetic security ink or toner. Banks verify that checks have this special feature for expediting processing of payments. After installing GoAntiquing! Point of Sale and running it I get a "Run-time error#339. Component 'Comdlg32.ocx'". What is going on and how do I fix this? Operating systems after Windows XP (e.g. Windows Vista, 7, 8/8.1 and 10) come with a feature called User Account Control (UAC) which enhances security by preventing programs from automatically running with administrative level access. GoAntiquing! Point of Sale fits into the category of software that need to run with administrative access and will produce this prompt. Unfortunately UAC goes a step farther and restricts access to "common components" such as Comdlg32.ocx. The solution is to disable UAC. First we recommend that you get a high-quality anti-virus and firewall program and understand how to use it and configure it. This gives far better protection than the UAC feature, if used properly and kept up to date. I have been getting Error #545 "Request cancelled by user" when trying to print reports to my networked printer. Why? This is caused by the network printer having gone to sleep. This occurs when either the host computer (the computer where the printer is connected) goes into "stand-by" or "sleep" mode, or if the network adapter has been disabled to conserve power. You need to change two basic settings. Change your "System standby" setting to "never"
Uncheck the checkbox labeled "Allow the computer to turn off this device to save power"
You should do this for ALL computers on your point-of-sale network. A similar procedure can be followed in Windows Vista/7/8/8.1/10. If you are shopping for a new printer for your business you should consider a Laser Printer of some brand with a network connection built in. However, the settings above should be used regardless! I have been getting Error #-2147467259 - Unrecognized database format" and "Specified database is invalid" when trying to open my networked POS database. Why? Your database has experienced some corruption. This could be minor, and fixable with the steps outlined below, or more serious, in which case you will need to restore from a backup (you ARE making daily backups, right?). The most likely cause for this error is that one or more of the computers that are running GoAntiquing! Point of Sale on your network have gone to "sleep" or have entered "stand-by" mode, or that you are running multiple registers with a WiFi network connecting the computers (this is expressly not supported and you are at risk if you do so). You need to change several settings related to power management. First, let's fix the likely cause of the error. Open the "Power Options" icon. Change your "System standby" setting to "never". You may also have a "Sleep" button on your keyboard or computer. This needs to be disabled to avoid accidental use. Click on the "Advanced" tab and find appropriate option under the "Power buttons" section and choose "Do nothing". Still in Control Panel open up the "Network Connections" icon. Find your active connection, e.g. "Local Area Connection", right-click it and select Properties. Click the "Configure" button of the network adapter. Click the "Power Management" tab. Uncheck the checkbox labeled "Allow the computer to turn off this device to save power". You should do this for ALL computers on your point-of-sale network! A similar procedure can be followed in Windows Vista, 7, 8/8.1 and 10. We recommend, if not already selected, you choose the "High performance" power plan. For the active power plan, click "Change plan settings"
Change the "Put the computer to sleep" to "Never". Note if you have an option for "When plugged in" and "When on battery" do this for both settings. If you have an option for "What happens when I close the laptop lid" (or something to that effect), change setting to "Do nothing". Click "Change advanced power settings", which opens a "Power Options" popup dialog. Scroll in the list of options for the "Power buttons and lid" option, click the + sign to open up the deeper settings. For the option "Sleep button action", click the + to see the deeper setting, and change setting to "Do nothing". If you have an option for "Lid close action", click the + to see the deeper setting, and change setting to "Do nothing". Return to top level Control Panel and locate the "Network Connections" icon. Fixing the database is best done by our technical support staff, and depending on level of corruption the repair may result in data loss, which is why we always recommend restoring from a backup file as a first step. There is a "quick and dirty" option that can get you going temporarily, but if you use this option you should contact GoAntiquing! Support to help you determine if additional repair steps are reqiured. Make sure only 1 computer on your network is running GoAntiquing! Point of Sale. From that computer (and on a network this should be the "main" computer) select the File menu option and click "Repair database". The repair operation will proceed without any progress messages, for large databases please be patient. You will receive a success or failure message. Please note that you should consider requesting support if any time you feel you may have experienced data loss as a result of data corruption. If you receive a failure message you need to restore your database from a backup. Remember: You can always call support at 800-385-7911 for assistance in accordance with our support policy. My old computer is being replaced with a newer one, how do I transfer GoAntiquing! to the new computer? First, download and install the latest GoAntiquing! on your new PC. After installing it, go ahead and transfer your database and any Settlements from the old PC to the new PC. After you get the transfer completed, run GoAntiquing! and use File / Open Database to select the database you just transferred. That's it. Safely eject the memory stick using the icon that should be down by the digital clock display on the lower right corner of Windows. Copy and paste the MDB file and Settlement folder from the memory stick window to the C:\Data Files\GoAntiquing! POS window, confirm all overwrite prompts with "Yes to all" or "Copy and Replace"
From the "File" menu of the program select "Open Database"
From the next screen, Activation, you will need to communicate the 20-digit 'Hardware Key Info' and the 'Activation Text' (e.g. My Antique Mall) to Support. There are several ways to do so, listed at the top of the form with circular "option" buttons, what you should use if at all possible is the option to email the info to Support. Sometimes computers are not setup with email on the desktop, so if that does not work, copy and paste the information to another type of email system (such as your hotmail, gmail, yahoo mail, etc, account and send to support@goantiquing.net with enough info so we know who you are and to verify you are an existing customer). You can always call in with the info to the 800-385-7911 support line. Note: In the above list we assume you installed GoAntiquing! to the standard location and Data Files were setup to go into the standard folder C:\Data Files\GoAntiquing! POS, if not the replace that folder name with the appropriate one, however it is important that the folder you are copying to is the exact location that you are copying from. Copyright © 2008-2019 Brave New Software, LLC. All Rights Reserved.